Six weeks ago I planted 6 small basil plants. 3 days ago I learned how to harvest it. I used to just go out there when I needed a handful and pick from each one of the plants till I got what I needed. I could never figure out why my basil was always spindly and scrawny. It's all in the harvesting!!! You can learn how too, from my neighbor and friend, Michelle. She has a little video clip HERE and she will teach you better than I could. ALL this from 14 cups of basil! The recipe I used is also linked to Michelle's blog. Into the freezer for those cold, snowy days of winter when we need a bit of freshness in our soups, pastas, and breads. 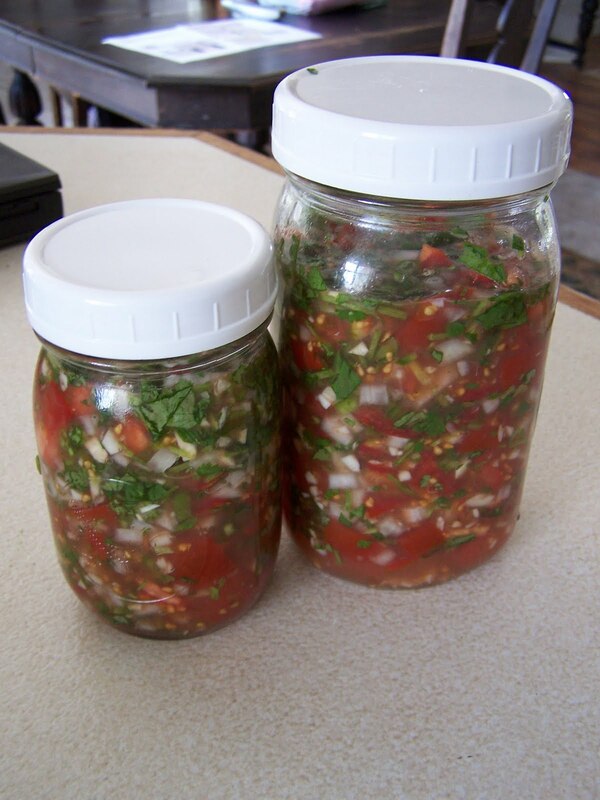 I've been experimenting with fermenting veggies lately and came across this recipe from Lydia, from Divine Health blog, for fermented salsa. The whey gives it a kind of a fizzy taste that goes perfectly with the tomatoes and peppers. Mix all ingredients (except water) together in a bowl, then place in a wide mouthed quart sized jar. Press down lightly with a wooden pounder or a spoon. Add more water if necessary to cover the vegetables. The top of the vegetables should be at least 1 inch below the top of the jar. Cover tightly and keep at room temp. for about 2 days before transferring to cold storage. I got my whey from making cheese a couple of weeks ago. It will last for months in the fridge, so I am keeping it down in the basement fridge for more salsa! Now, if only I could bottle this and sell it!!! What is your summer tasting like? FIRST...I LOVE your play selection. I have Keith Green and this album on my ipod and workout to it daily! Such great music! Looks like the recipe I used for my salsa too. I think I added cilantro though, love cilantro! So glad you are 'putting up' so much pesto! You will be thrilled come January! We never make enough. Last year, I was saving it till the very end, I had tons of basil out there and guess what happened? It froze one night!!! I literally cried. 24 plants of basil, loaded with leaves, countless containers of pesto turned black :-( It was awful! On a happier note, I did make those pickles with the baby cukes from Costco, turned out pretty good. I didn't have dill and forgot to put garlic in, but other than that, they were good. Can't wait to use my own! BTW, went to Holland Farmer's Market this Saturday. so disappointing that so many vendors spray and are pretty crabby about it too! It intimidates me! Found a neat organic guy though, boy what a difference in personality. Bought scapes(?) and purslane (?) and some baby sweet onions just to support him! You're right, Michelle. I DID add cilantro to mine too. I am going back to edit and add it to the ingredients list right now. I am like Barbara, I have heard of Pesto but not sure how to use it. Looks like it is good (very pretty in the jars). Would love some info on it. 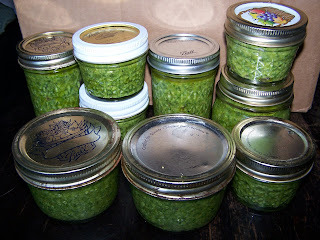 For Barbara and Cheryl: Pesto is a paste/sauce made from basil, olive oil, pine nuts or walnuts, (or you can leave the nuts out entirely,) and parmesan cheese. I use little dabs of it on fresh from the garden tomatoes with a little drizzle of olive oil, sea salt, and black pepper. I use it in soups, pasta dishes, focaccia bread, pizza....a little goes a long way. It is salty, basily, olive oily and WONDERFUL! If you like basil, you would likely love pesto. 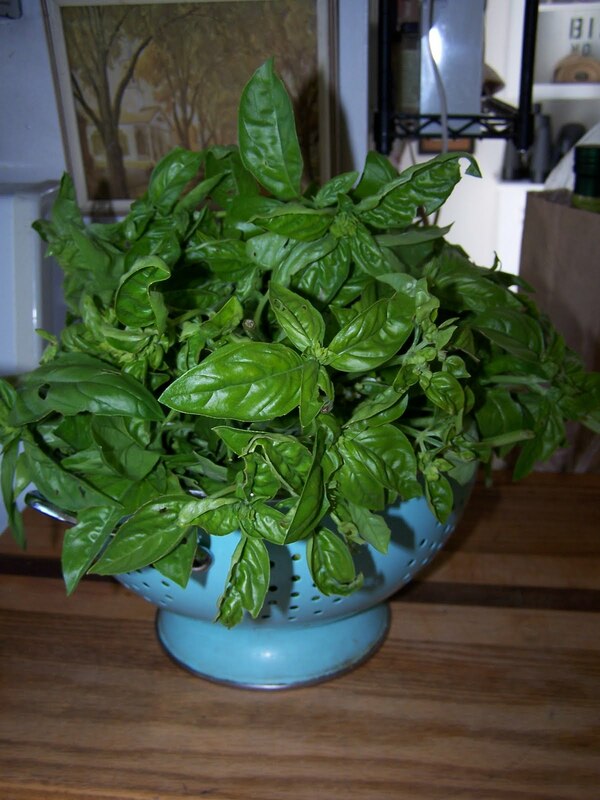 I love basil too and had the same problem you have, so now I am thankful for your info. Since the weather has finally warmed up here (today!) our garden should pick up too. You are getting a lot done there Cyn, and I always learn so much from your blog!The canned salsa looks like a kitchen warmer come winter. Hey that salsa recipe is pretty much the same as Sally's from Nourishing Traditions ;), thought I'd mention that!! Glad you like it!! I just made some more yummy ferments, one with cauliflower, green beans and onions that I simply adore!! WOW! That all looks so yummy, thanks for the recipes. And THANKS for the head's up about picking basil, I'm having the same problem you were. And now we know! You amaze me! Always being productive. The pesto looks quit refreshing. You'll have to stop and see Riley's birthday picture. I actually watched that video when you first linked to it, but haven't gotten around to commenting until now. Great info. I love when someone takes you out with them, video in hand, and teaches you something as if you were there. So helpful. You inspired me to try making some Pesto. On you picture of the Pesto you made how many batches was that? I made only one batch and got 2 jelly jars a little over half full. Wasn't sure if I had packed my basil into the cups enough. Tasted good! Cheryl, I got 14 stuffed cups of basil, so it made 9 of those containers pictured. 4 of the containers were tiny, like 1 cup? Great ideas, Cyn - I've got basil, too, and that pesto would be wonderful later on in the winter.